Black History Month: Then and Now in Education with Charlotte Grimké and John B. King Jr.
For Black History Month, we are honoring pioneers and their heirs apparent. There are so many black pioneers in the arena of education, but one who stands out is Charlotte Forten Grimké, who was born into an affluent family that had fought for racial equality for generations. Charlotte Forten Grimké was the first northern African American schoolteacher to go south to teach former slaves. Grimké was born in Philadelphia in 1837 into an influential and affluent family. Her grandfather had been an enormously successful businessman and significant voice in the abolitionist movement. The family moved in the same circles as William Lloyd Garrison and John Greenleaf Whittier: intellectual and political activity were part of the air Charlotte Forten Grimké breathed. She attended Normal School in Salem, Massachusetts, and began her teaching career in the Salem schools, the first African American ever hired. But she longed to be part of a larger cause, and with the coming of the Civil War Grimké found a way to act on her deepest beliefs. In 1862, she arrived on St. Helena Island, South Carolina, where she worked with Laura Towne. As she began teaching, she found that many of her pupils spoke only Gullah and were unfamiliar with the routines of school. Though she yearned to feel a bond with the islanders, her temperament, upbringing and education set her apart, and she found she had more in common with the white abolitionists there. Under physical and emotional stress, Grimke, who was always frail, grew ill and left St. Helena after two years. Today, Grimké is best remembered for her diaries. From 1854-64 and 1885-92, she recorded the life of an intelligent, cultured, romantic woman who read and wrote poetry, attended lectures, worked, and took part in the largest social movement of her time. She was determined to embody the intellectual potential of all black people. She set a course of philosophical exploration, social sophistication, cultural achievement and spiritual improvement. She was, above all, dedicated to social justice. 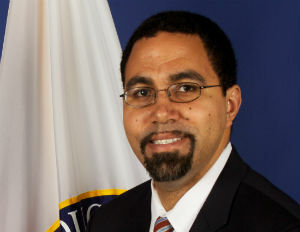 John King Jr. is the first person of African American and Hispanic descent to be appointed Acting Secretary of the Department of Education. Previously he was Acting Deputy Secretary, and before that, the first African American and first Puerto Rican to be appointed Commissioner of Education of the State of New York. Before King assumed these high-profile leadership roles, he was an award-winning teacher, receiving the James Madison Memorial Fellowship for secondary-level teaching of American history, American government, and social studies. He also co-founded a high-performing charter school in Boston, the Roxbury Preparatory Charter School. King received a B.A. in government from Harvard, a Juris Doctor from Yale, and a Ph.D. in educational administrative practice from Columbia University Teachers College. Although King was born into a well-educated and accomplished family (his father was the first black principal in Brooklyn, New York; he later became executive deputy superintendent of schools; his grandfather had attended New York University Law School), he experienced devastating loss and instability as a youngster, losing both his parents by the time he was 12. Seeing school and teachers as an anchor, he himself became a teacher and education leader, perhaps living out the potential that Charlotte Forten Grimké foresaw for all people of African descent more than a hundred years earlier. ST. HELENA ISLAND, S.C. — The Penn Center, a historic African American cultural institution that once educated freed slaves on the South Carolina coast and later served as a retreat center for civil rights leaders such as the Rev. Martin Luther King, is celebrating its 150th anniversary.